Candied Herbs: Line a baking sheet with a paper towel. Pour sugar into a shallow bowl. Stir egg white with a fork to break up clumps. Dip herbs into egg white and blot any excess. Dip into sugar and let dry on paper towel for 4 hours until dry. Lemon Glaze: In a medium bowl, whisk together the egg white, cream of tartar, sugar, lemon zest and lemon juice until smooth. Cover and set aside until ready to glaze cookies. Dough: Preheat oven to 350°F. Line baking sheets with parchment paper. Place butter in the bowl of a stand mixer fitted with a paddle attachment and beat on medium speed until smooth and creamy, about 1 minute. Slowly add the sugars and salt and beat on medium speed until smooth, about 1 minute. Reduce speed to low and add the egg yolks, one by one, until combined, about 1 minute. With the mixer on low, slowly add the flour to the bowl, until dough is soft and moist, about 30 seconds. Scrape the dough onto surface and divide in half. Wrap each disc with plastic wrap and place in freezer for 30 minutes. When ready to cutout shapes, remove dough from freezer. Place dough between 2 large pieces of parchment paper and roll until 1/8” thick. Transfer parchment to baking sheet and freeze until dough is firm, about 25 minutes in the freezer. Remove dough from freezer and discard the top sheet of parchment. Using a cookie cutter stamp out exterior and interior rounds. Transfer cookies to prepared baking sheets and space them 1 inch apart. Bake until cookies are lightly golden around the edges, about 12-14 minutes. Let cookies cool on a baking rack. To decorate, dip tops of cookies into lemon glaze, let excess drip off. 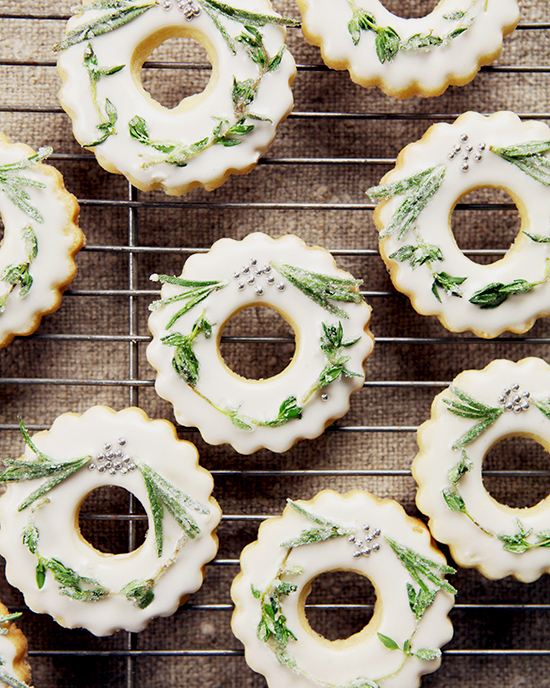 Transfer to a wire rack and top each cookie with candied herbs forming wreaths. Garnish with silver dragees if desired.